there’s nothing better than coming home from church on a sunday afternoon, opening the door, and having the smell of pot roast to greet you. actually, there is one thing better than that – knowing that dinner is already pretty much done! this is the slow cooker pot roast my mom has made for years. it is fall-apart, melt-in-your-mouth good. and this is her oh-so-easy recipe. to prepare the roast, heat oil in a large skillet - just enough to cover the bottom of the pan. brown roast for about 1 minute on each side. place in slow cooker. sprinkle the onion soup mix over top of the roast. the more/bigger roast you have, the more soup mix you'll use (for a small roast, use one envelope; for 1 large or 2 small roasts, use 2 envelopes, etc.). pour in enough water to cover the roast about ¾. cook on high for 6-8 hours. 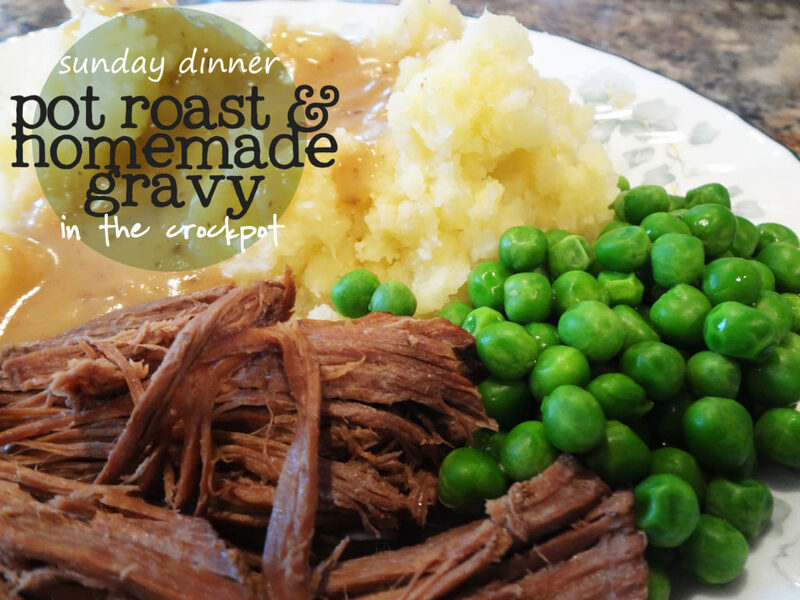 to make homemade gravy: when roast is finished cooking, remove it from the slow cooker. pour remaining liquid into a large pot and simmer. meanwhile, in a blender, combine equal parts water and flour (1 cup water - 1 cup flour). if it seems to thick, just thin it out with more water. slowly whisk this mixture into the simmering liquid. you will see it start to thicken. the more flour mixture you add, the thicker it will get. (again, if the gravy itself gets to thick, just thin it out with a little water.) add salt and pepper to taste. serve roast and gravy with mashed potatoes, veggies, and rolls. enjoy! I’ve never made homemade gravy before and I followed your directions and put the water and flour in my blender and stirred it in gradually to my crockpot juices from my roast and it came out perfect. I was very excited because it tasted so incredibly good and no lumps. Thank you! You’re welcome! Glad it worked for you!